Add the ingredients to a slow cooker and set aside for 7-8 hours on low or 4-5 on high. When ready to serve, set the oven to a broil. Remove the chicken from the crockpot. Use a fork to shred the meat. Place the meat on a baking sheet and broil for 3-4 minutes until the meat is crispy. Serves 4 [Per serving: 150 calories, 8g fat, 20g protein]. Add the diced apples and butternut squash to the bottom of a crockpot. Top with the roast. In a separate bowl, whisk the sparkling apple cider with the vinegar, garlic, thyme, salt and pepper. Pour over the roast. Cover and heat on low for 6-8 hours. Add ingredients to a slow cooker then sprinkle salt and pepper, stirring to combine. Simmer on low heat and keep covered (all day/night), until the liquid is absorbed and the chicken is cooked through. For quicker cooking times, set the slow cooker to high heat and simmer for 2 hours. Serves 4. Steam the cauliflower florets for 8-12 minutes until tender. Transfer them to a blender or food processor and set aside. Heat a separate large saucepan to medium-high heat and add the olive oil. Add the corn, carrots, yellow onion and bay leaves and stir to sauté. Cook for 4-5 minutes, until the onion is translucent. Pour the broth into the saucepan and turn the heat to low to allow the mixture to simmer for about 5 minutes. Pour the contents of the saucepan into the blender and pulse to purée with the cauliflower, until the consistency is a thick and creamy soup. Serve hot. Serves 4-6. Pulse ingredients in a food processor until pureed. Chill for at least 6 hours then serve as a cold soup. Add ingredients to a slow cooker. Simmer on low heat and keep covered (all day/night). For quicker cooking times, set the slow cooker to high heat and simmer for at least 2 hours. Serve with cilantro and Cornbread Muffins. Preheat the oven to 400 degrees. Microwave the sweet potato for 4-5 minutes to soften, then cut it into small cubes. Toss the diced sweet potatoes with the green onions and place on a baking pan coated with nonstick spray. Roast for 30-45 minutes, until the potatoes are tender. With 15 minutes remaining, add the chopped prosciutto and stir to combine, then continue to bake until crispy. Meanwhile as the sweet potatoes cook, fill a large pot with the cauliflower and enough water to submerge the florets. Bring the water to a boil and cook for 10 minutes, until the cauliflower is tender. Drain, then transfer to a Vitamin or blender and pulse to combine with the chicken broth, almond milk, garlic powder, salt and pepper. Blend until smooth and creamy. Transfer the creamy cauliflower mixture back to the saucepan and simmer on low heat. Stir in the roasted potatoes, green onions and prosciutto and cover for 2-3 minutes. Ladle the soup into three bowls. [Serves 3, per serving: 240 calories 4.5g fat, 38g carbs, 8g fiber, 9g sugar, 16g protein]. Combine ingredients in a blender with salt and pepper and pulse until creamy. Pour into a saucepan then turn the stove to high heat to bring the mixture to a boil. Turn the heat to low and allow the soup to simmer, 10-12 minutes. Makes 5 servings (per serving: 130 calories, 9g fat, 9g carbs, 2g fiber, 7g sugar, 6g protein]. Add ingredients to a slow cooker and cook for 6 hours on low heat. Makes 5 servings [Per serving: 310 calories, 4.5g fat, 28g carbs, 6g fiber, 6g sugar, 40g protein]. Fill a large pot with the chicken and enough water to submerge, then bring the water to a boil. Reduce the heat and boil for 15-20 minutes until the chicken is cooked through the center. Drain the chicken then chop and place in a saucepan. Add the chicken broth, rice, bay leaves, celery, carrots, onion, salt and pepper. Bring the liquid to a boil, then turn the heat to low and simmer until the rice is cooked, 20-25 minutes. Makes 5 servings [Per serving: 310 calories, 5g fat, 35g carbs, 4g fiber, 3g sugar, 33g protein]. Preheat the oven to 400 degrees. Toss the butternut squash and onion with the coconut oil, then lay flat on a baking sheet. Roast for 25-30 minutes, until the squash is tender. Transfer the squash to a Vitamix, blender or food processor. Pour in the broth and almond milk, then sprinkle the cinnamon, nutmeg, sea salt and pepper. Blend until smooth and creamy. Serve hot, makes 5 servings [Per serving: 130 calories, 7g fat, 18g carbs, 3g fiber, 4g sugar, 4g protein]. Combine the beets, walnuts, 1 cup oats, egg and onion in a food processor and pulse to combine. Transfer to a mixing bowl and stir in the remaining 1⁄2 cup oats plus salt and pepper to taste. Heat a skillet to medium heat then lightly coat the bottom with nonstick cooking spray. Form the beet mixture into 5-6 patties, then place on the hot skillet. Cook the beet burgers on medium heat for 6 minutes, flipping every 2 minutes until the middle is cooked through. Remove from the heat, top with goat cheese and arugula. Serves 5-6. Add quinoa to a small saucepan and bring to a boil with 1 cup of water. Turn down the heat and simmer for around 15 minutes, until the water is absorbed. Combine the quinoa with the remaining ingredients, salt and pepper using a food processor or mixer. The consistency should resemble a thick hummus - if the mixture does not hold, add more oats. Heat a large skillet to medium heat and coat the bottom with nonstick cooking spray. Add four 1/2 cup-sized scoops of the bean mixture into the skillet. Cook for 1-2 minutes, then use a spatula to flip and flatten the patties (as if you are making pancakes). Cook for another minute or 2, until both sides are slightly browned. Remove, then repeat the process as necessary. Combine sweet potato, spinach, oats, red onion and preferred spices in a food processor and pulse to combine. Stir in cranberries and sunflower seeds. Shape sweet potato mixture into 2 patties. Heat a skillet to medium-high heat and coat the bottom with nonstick spray. Cook 2-3 minutes on each side, or until inside is hot. Serve warm. In a small bowl combine chia seeds and 1/4 cup water and set aside until gel consistency forms. Stir as needed. In a separate bowl, microwave mushrooms with salt and pepper for 2-3 minutes until soft. Add spinach, mushrooms, onions, chickpeas, oats, chia and preferred spices to a food processor. Pulse until smooth. Heat a skillet to medium-high heat and coat bottom with nonstick spray. Shape spinach mixture into 6 patties then place in the pan. Cook for 2-3 minutes on each side until lightly browned. Enjoy with your favorite burger condiments. Serves 2. In a small mixing bowl, combine the hummus and bread crumbs. Heat a skillet to medium-high heat and add the avocado oil. Swirl to coat the bottom. Shape the hummus combination into two patties and place them in the skillet. Cook for 6-8 minutes, flipping halfway through until the patties are lightly brown on each side. Remove from the heat. Serve the patties on two plates over a bed of spinach. Top with the sliced avocado. Makes 2 servings [Per serving: 210 calories, 7g fat, 19g carbs, 5g protein, 0g sugar]. Optional: serve over noodles or spiraled vegetables! Preheat the oven to 425 degrees. Microwave the sweet potato for 4-5 minutes until the middle is soft when you pierce with a fork. Heat a saucepan to medium-low and add the pinto beans, cauliflower rice, spices, salt and pepper. Heat until warm, then turn the stovetop to low. Scramble or fry the egg. Prepare the sweet potato cutting in half lengthwise and stuffing with the beans & rice. Top with the egg and avocado slices. Makes 1 serving [Per serving: 365 calories, 14g fat, 43g carbs, 15g protein, 8g sugar]. Preheat the oven to 425 degrees. Add the cauliflower florets to a large mixing bowl. Pour in the egg whites and toss. Next, add in the coconut flour and shredded coconut and toss to evenly coat, making sure each cauliflower floret is "breaded." Lay flat on a roasting pan and bake 30-35 minutes, until the cauliflower is golden brown and crispy. To prepare the sauce, mix the Greek yogurt, rice vinegar and desired amount of Sriracha until creamy. Serve the cauliflower with the Sriracha sauce, either as a dip or dressing. Serves 2-3. Preheat oven to 425 degrees. Marinate Portobello mushrooms with balsamic vinegar, mustard, garlic powder, salt and pepper for at least 30 minutes. Drain the excess marinade, then place the mushroom caps face down on a baking sheet. Bake for 15 minutes until the mushrooms are tender. Remove from the oven and top each with sprouts, avocado slices and pesto. Serve with your favorite burger condiments. Preheat grill to medium-high heat, or the oven to 425 degrees. Lay carrots flat on a piece of foil or baking sheet coated with nonstick cooking spray. Sprinkle with salt and pepper. Grill or bake for 25-30 minutes, until carrots are tender. If using an oven, turn the temperature to a broil and cook for an additional 2 minutes. Remove from the grill or oven and place in a hot dog roll or lettuce cup. Add desired toppings. Preheat the oven to 425. Pour egg whites into a small bowl and the flour into a separate larger bowl. Take each cauliflower floret and submerge it in the egg whites, then roll it in the flour until completely covered. Place flat on a baking sheet and repeat for all the florets. Bake for 15 minutes. Remove the pan from the oven and toss the cauliflower with Buffalo sauce. Bake for another 15 minutes. Preheat the oven to 450 degrees. Lay the cauliflower florets and onions flat on a baking sheet coated with nonstick spray. Squeeze one half of the lemon over the cauliflower and onions, then place the lemon slices on the baking sheet. Lay the shredded sweet potatoes flat on a separate baking sheet coated with nonstick spray. Roast the vegetables for 25-30 minutes, or until the cauliflower and sweet potatoes are lightly browned. While the vegetables are cooking, prepare the lentils and quinoa in separate saucepans, according to the instructions on the package. Prepare two bowls with the lettuce, cauliflower, onions, shredded sweet potato, quinoa, and lentils. Dress withLemon Poppyseed Dressing and toss to coat. Serves 2. Combine ingredients and toss with lime juice, salt and pepper. Serves 4 [190 calories, 9g fat, 12g carbs, 5g fiber, 4g sugar, 18g protein]. Heat 1 tablespoon of olive oil in a large skillet on medium heat. Add the onion and cook for 4-5 minutes until slightly brown and translucent. Add the shrimp and lemon juice, and sauté 2-3 minutes per side. Turn off the heat, cover and set aside. In a separate saucepan, bring the almond milk to a boil. Add the oatmeal and turn to low heat to simmer for 2-3 minutes. Sprinkle the cheddar cheese, salt and pepper until the cheese melts. Serve two plates with the cheesy oatmeal topped with the shrimp. Toss shrimp with olive oil, spices, salt and pepper and marinate at least 10 minutes. Heat skillet to medium heat. Cook shrimp 2-3 minutes per side. Heat a skillet to medium-high heat and add the oil. Sauté the shrimp for 5-7 minutes, until pink. Prepare the salad by tossing the kale, mint, watermelon, feta and balsamic vinegar. Top with shrimp. Add the romaine lettuce to a large salad bowl and set aside. Heat a skillet to medium-high. Toss the fennel slices with the melted coconut oil then add to the skillet. Sauté 10-12 minutes, flipping occasionally until the fennel is caramelized. Remove the fennel from the heat and place in the lettuce bowl. Add the salmon fillets to the skillet and sprinkle with salt, pepper and optional parmesan cheese. Cook for 3 minutes then flip and cook for another 4-5 minutes, until the salmon is cooked through the center and flakes with a fork. Toss the lettuce and fennel with the Caesar Dressing and ground pepper, then top with the salmon. Serves 2. Set oven to a broil. Place the tilapia on a foil-lined baking sheet lightly greased with nonstick spray. Sprinkle salt and pepper. Broil for 5 minutes on each side, until the fish flakes with a fork. While the fish cooks, prepare the avocado dressing by pulsing the avocado, jalapeño and apple cider vinegar in a food processor or blender until creamy. Toss with the slaw mix, kale and pineapple and transfer to 2 bowls. Top each bowl with a piece of fish. Serves 2 [Per serving: 280 calories, 9g fat, 21g carbs, 33g protein, 9g sugar]. Preheat the oven to 400 degrees. In a small bowl, combine the melted coconut oil, dijon mustard, maple syrup, salt and pepper. Lay the salmon fillets on a foil-lined baking sheet. Brush with the maple-dijon marinade. Bake 12-15 minutes, or until the salmon flakes with a fork. Cut the tilapia into small pieces and place in a large bowl. Add in the freshly squeezed lime juice to submerge te fish, then cover the bowl with plastic wrap. Place the bowl in the refrigerator and allow the fish to soak in the citrus for 1-2 hours. Remove from the refrigerator and toss with red pepper, red onion, cilantro and sea salt. Preheat the oven to 425 degrees. Microwave the sweet potato for 5-7 minutes, until just slightly tender. Carefully remove from the microwave and cut the potato into small wedges. Add the sweet potato wedges, egg whites, 1 tablespoon Old Bay, 1 teaspoon garlic powder, salt and pepper to a large Ziploc bag and shake to coat. Lay the wedges flat on a foil-lined baking sheet and bake for 40-45 minutes, or until slightly brown and crisped. While the sweet potatoes are baking, prepare the fish: Mix flour, 1/2 tablespoon Old Bay, 1 teaspoon garlic powder, salt and pepper in a shallow dish. In a separate bowl, add the ginger ale. Dip the fish in the flour, then dunk in the ginger ale, then again in the flour, shaking off the excess. Spray both sides with nonstick cooking oil, then place on a small foil-lined baking sheet. Add to the same oven and bake for 20 minutes. Remove and serve with the sweet potato wedges. Serves 1. Combine ingredients, salt and pepper in a mixing bowl. Shape into six patties and place on a broiler pan coated with nonstick cooking spray. Set the oven to a broil and cook for 4 minutes. Flip the crabcakes and broil for another 4 minutes, until crab cakes are lightly browned. Remove from the oven and enjoy with condiments such as lettuce, tomato, avocado, or cocktail sauce. Heat a large skillet to medium heat and coat the bottom with nonstick spray. Add the chicken, asparagus and broccoli and sauté for 10 minutes, stirring occasionally. While the chicken and veggies cook, prepare the beet pesto by pulsing the beets, walnuts, parmesan and basil in a food processor. Transfer to the skillet and toss to combine with the chicken and veggies, cooking for 1-2 more minutes. Serves 6. Sprinkle kosher salt on the flank steak, cover and set aside in the refrigerator for at least 30 minutes. Prepare the marinade by combining jam, vinegar, soy sauce, garlic, honey, salt and pepper. Marinate flank steak for at least one hour. When ready to cook, preheat the oven to a broil. Place the flank steak on a broiler pan and cook 4-5 minutes, then flip and cook for another 4-5 minutes. Remove from the oven and slice thin strips of steak at a slight angle. Serve warm. Prepare the spice rub by combining the paprika, chili powder, brown sugar, garlic powder, sea salt and pepper. Coat the pork chops with the spice rub. Heat a grill to medium heat. Spray both sides of the pork chops with nonstick cooking spray and transfer to the grill. Cook for 18-20 minutes, flipping twice until the pork is slightly pink but cooked through. Serves 4. Add chicken breasts and broccoli to a large Ziploc bag. Combine garlic, lemon, brown sugar, soy sauce, and coconut oil and pour into the bag to cover the chicken. Marinate for at least 20 minutes. Meanwhile, preheat the oven to 375 degrees. Add the marinated chicken breasts and broccoli to a pyrex baking pan and cook for 20-25 minutes, or until chicken is thoroughly cooked. Place the chicken tenders in a large Ziploc bag with the egg whites and allow the chicken to marinate for at least 30 minutes. Meanwhile, preheat the oven to 400 degrees. Place the Greek yogurt in a shallow bowl. Combine the flour and spices in a separate shallow bowl. To prepare the chicken, coat each chicken tender with the Greek yogurt, then dip into the flour and spices mixture to evenly coat. Place the chicken on a baking sheet coated with nonstick cooking spray. Repeat for each tender. Bake the chicken for 15-20 minutes, then flip and bake for another 15-20 minutes, or until the chicken is slightly browned and crispy. Serve with Slender Seven Honey Mustard Dressing. Add chicken to a large Ziploc bag with the onion, vinegar, ketchup, garlic powder, paprika, white pepper, salt and pepper. Marinate for at least an hour. Remove from the refrigerator and dump everything from the bag into a large saucepan. Add enough water to cover the chicken. Bring the liquid to a boil, then turn the burner down to low to simmer for 15 minutes, or until the chicken is cooked through. Keep the liquid in the saucepan but remove the chicken, then set aside. Bring the liquid to a boil and boil for 5-10 minutes, or until the liquid is reduced by 50%. While the sauce is boiling, finely chop or shred the chicken. Turn down the heat to low, add the chicken back into the saucepan and stir through. Cover with a lid until ready to serve. Makes 4 servings. Place chicken breasts in a large pot of water, enough to cover the chicken entirely. Bring the water to a boil on the stovetop, then reduce to medium heat and boil 15-20 minutes. While the chicken is boiling, prepare the pesto sauce by pulsing kale, avocado, broccoli, basil, olive oil, parmesan, salt and pepper in a food processor. Once the chicken is done (center should no longer be pink), drain using a strainer. Cut the chicken into small cubes and place in a large mixing bowl. Use a spatula to scoop in the pesto, then toss to coat the chicken. Allow the chicken to cool, then serve at room temperature or store in the refrigerator. Makes 4 servings. Add chicken to a large Ziploc bag. In a small mixing bowl, combine orange juice, teriyaki, sesame oil, sesame seeds, garlic and ginger. Pour into the bag, seal, and massage the marinade onto the chicken to coat. While the chicken is marinating, soak the skewers in water. Set oven to a broil. Thread 2 strips of chicken on each skewer, then set on a broiler pan. Broil 4-5 minutes, flip, and broil for another 4 minutes until the chicken is cooked through the center. Top with sesame seeds and serve over Spicy Stir Fry Veggies. Makes 4 servings. In a small bowl, mix the Greek yogurt and pesto until creamy to make a pesto "mayo". Toast the bread. Spread one slice with the pesto mayo. Top with the lettuce, tomato and prosciutto. Place the second slice of bread on top to form a sandwich. (Optional: instead of bread, make a salad by combining ingredients with 2 cups chopped romaine). Makes 1 sandwich [Per serving: 310 calories, 14g fat, 30g carbs, 22g protein, 8g sugar]. Heat a large skillet to medium-high heat. Add the garlic, green pepper, onion, salt and pepper. Sauté for 4-5 minutes, stirring occasionally, until the onion becomes translucent. Add in the ground turkey, using a wooden spoon to break apart the meat. Cook for 3-4 minutes until the turkey is no longer pink. Stir in the ketchups and mustard to cover the turkey mixture. Cook for 4-5 more minutes on medium heat. Serve the sloppy joe meat with a hamburger bun or lettuce wrap. Add the chicken and wing sauce to a slow cooker. Simmer on low heat for 4-6 hours. To make the lettuce cups, pull the chicken apart with a fork and stir in the sauce. Transfer the meat to the lettuce cups and drizzle with the blue cheese dressing. Prepare the blackberry chia jam by combining the mashed blackberries, chia seeds and lemon juice. Set aside for 15 minutes in the refrigerator, until the chia turns to a jelly consistency. Cut the slice of bread in half. Spread one half with the PB2 and the other half with the blackberry jam. Put the two halves together to make a sandwich. Heat a skillet to medium heat and lightly coat the bottom with nonstick cooking spray. Add the sandwich. Cook for 1 minute until lightly browned. Spray the top lightly with nonstick spray then flip, and cook for another 1 minute. Enjoy warm. Serves 1 [Per serving: 175 calories, 31g carbs, 5g fat, 12g protein, 10g sugar]. Wrap ingredients in a paleo wrap. Makes 1 taco [Per serving: 400 calories, 13g fat, 11g protein, 57g carbs, 15g sugar]. Preheat the oven to 400 degrees. Place the chicken, peppers and onions in a large roasting pan. Toss with the lime juice, agave and spices. Bake for 20-25 minutes, until the chicken is tender and cooked through. Place chicken breasts in a large pot of water, enough to cover the chicken entirely. Bring the water to a boil on the stovetop, then reduce to medium heat and boil 15-20 minutes. While the chicken cooks, pulse the avocado, jalapeño, apple cider vinegar and lime juice in the food processor until smooth. Drain and pull the chicken breasts into strands. Prepare the tacos by placing the pulled chicken on a tortilla or lettuce cup. Top with the avocado sauce, pomegranate seeds and cilantro garnish. Serves 4 [Per serving: 250 calories, 12g fat, 6g carbs, 30g protein, 2g sugar]. Heat a skillet on medium heat. Coat the bottom with nonstick cooking spray and add meat. Brown the meat until fully cooked. Add the beans and spices to the skillet and stir. Simmer on low heat for 5-7 minutes longer. Serve with tortillas, lettuce, or sides of choice. Serves 4. Prepare the spice rub by combining equal parts of cumin, paprika, garlic powder and oregano. Sprinkle salt and pepper. Heat a large skillet to medium heat. Spray coconut oil to coat the bottom. Cover each side of the fish with the spice rub then place in the skillet. Cook for 5 minutes on each side. Serve on corn tortillas or lettuce cups with desired toppings. Prepare the lentils in a saucepan according to the instructions on the package. In a separate skillet, heat the oil to medium-high heat. Add the garlic and diced onion. Cook for 5-7 minutes, stirring frequently. Drain the cooked lentils then pour into the skillet. Stir in with the garlic and onion, then add the spices. Cover and turn the heat down to medium. Cook for another 6-8 minutes, stirring occasionally. Serve the lentils with tortillas and/or lettuce wraps. Serves 2 [Per serving: 245 calories, 5g fat, 41g carbs, 20g protein, 4g sugar]. Preheat the oven to 350 degrees. In a medium nonstick skillet, add the ground turkey and chili powder, crumbling the meat with a spatula. Brown the meat for 5-7 minutes. While the meat is cooking, arrange the chips on a cooking sheet lightly coated with nonstick cooking spray. Top with the meat, then layer the tomatoes, black beans and onions. Sprinkle evenly with the cheese. Bake in the oven for 10-12 minutes until the cheese is bubbly and melted. Serve hot. Makes 6 servings [Per serving: 260 calories, 11g fat, 16g carbs, 2g sugar, 25g protein]. Remove the meat from the rotisserie chicken and chop. Transfer the chicken to a large mixing bowl. Add the edamame and slaw. Prepare the dressing by whisking the PB2, soy sauce, sesame oil and agave. Toss with the chicken and slaw until coated. Makes 4 servings [Per serving: 295 calories, 13g fat, 13g carbs, 30g protein, 7g sugar]. Place chicken breasts in a large pot of water, enough to cover the chicken entirely. Bring the water to a boil on the stovetop, then reduce to medium heat and boil 15-20 minutes. While the chicken is boiling, prepare the dressing by pulsing avocado through parsley in a blender until creamy. Drain the chicken then transfer the cubes to a bowl and mix with the Green Goddess Dressing. Serve warm or chilled. Makes 4-6 servings. Place chicken breasts in a large pot of water, enough to cover the chicken entirely. Bring the water to a boil on the stovetop, then reduce to medium heat and boil 15-20 minutes. Check to make sure the chicken is cooked through and the center is no longer pink. Once the chicken is done, drain using a strainer. Cut the chicken into small cubes and place in a large mixing bowl. Combine with mayonnaise, red onion, apple, dried cranberries, tarragon, celery, salt and pepper. Store in the refrigerator. Makes 4 servings. *Shortcut: buy a rotisserie chicken and remove the skin. Use a sharp knife to cut the white and dark meat off the bone. Use your hands to remove any remaining meat. Discard the skin, fat, and bones. Complete steps with the pulled chicken. Combine ingredients in a mixing bowl and stir to coat the pulled chicken. Chill and serve with cracked pepper. Serves 2-3. Mix ingredients and stir to combine. Mix tuna fish with remaining ingredients, salt and pepper. Stir well to combine. Combine the tuna, celery, red onion and dill in a mixing bowl. Toss to combine with the orange juice, yogurt, vinegar, salt and pepper. Serve over a salad or on whole grain bread. Makes 3 servings [Per serving: 150 calories, 1g fat, 3g carbs, 2g sugar, 30g protein]. Place chicken breasts in a large pot of water, enough to cover the chicken entirely. Bring the water to a boil on the stovetop, then reduce to medium heat and boil 15-20 minutes. In a separate saucepan, bring the quinoa and 1 cup of water to a boil on high heat. Turn the heat to low and simmer for 15 minutes. Transfer the cooked quinoa to a large mixing bowl. Strain the chicken and cool completely. Chop the chicken into small pieces, and add to the quinoa bowl. Stir in the carrots and grapes. Toss with the Greek yogurt, apple cider vinegar, curry, salt and pepper. Makes 4 servings [Per serving: 265 calories, 2g fat, 26g carbs, 36g protein, 9g sugar]. Preheat the oven to 450 degrees. Microwave the sweet potatoes on high for 5 minutes, then remove and cut into cubes. Place on a baking sheet lightly coated with nonstick spray and roast for 20-25 minutes until lightly browned. While the sweet potatoes cook, make the sauce by blending almond butter, curry powder, vinegar and agave (or dates) until smooth [optional: spice it up with some sriracha]. Use a food processor to pulse the raw cauliflower florets into rice. When the potatoes are finished cooking, transfer to a large mixing bowl and toss with the cauliflower rice, cilantro and curry dressing. Makes 4 servings [Per serving: 230 calories, 9g fat, 35g carbs, 8g fiber, 16g sugar, 9g protein]. Add ingredients to a slow cooker, stirring to combine. Simmer on low heat and keep covered (all day/night). For quicker cooking times, set the slow cooker to high heat and simmer for at least 2 hours, until the chicken is cooked through. Serves 4-6. Preheat the oven to 400 degrees. Spray a foil-lined baking sheet with nonstick coconut oil spray to coat. Add the sweet potatoes and onions and cook for 35-40 minutes, stirring occasionally, until golden brown and tender. While the sweet potatoes and onions roast, heat a skillet to medium-high heat. Coat the bottom with nonstick spray. Cook the turkey burger for 3-4 minutes on each side. Turn the heat down to low and cover the skillet with a lid, leaving a slight gap to allow the steam to escape. Cook for an additional 8-10 minutes (flipping halfway through) until the turkey burger is fully cooked. Serve the turkey burger over the roasted potatoes and onions and a side of the kale tossed with caesar. Serves 1. Set the oven to a broil. Mix the ground turkey with the spices. Shape the turkey into 4 patties then place on a foil-lined baking sheet. Broil for 4-5 minutes then flip, and cook for another 4-5 minutes. Serve with apricot jam. Preheat the oven to 450 degrees. On a flat baking sheet, toss the apples, shallots and maple syrup. Roast for 15-20 minutes until tender. Remove from the oven, transfer to a bowl and cover with foil. Set the oven to a broil. Place the beef patties on a broiler pan and create a dimple in the center of each burger. Broil in the oven for 3 minutes, flip, and cook for another 3-4 minutes, or until the burger reaches your desired doneness. Remove and top with the roasted apples and shallots, and Pumpkin ‘Chups. Sprinkle with gorgonzola. Makes 4 burgers [Per serving: 390 calories, 22g fat, 27g carbs, 6g fiber, 17g sugar, 25g protein]. Preheat grill (or broiler) to 450 degrees. Shape the meat into four patties. Grill the burgers for 2 minutes on each side. Flip and cook for another 3-6 minutes until the center is cooked to your desired doneness. Remove from the heat and place each burger on a bun (optional, or substitute lettuce wrap). Top each burger with ½ ounce goat cheese, ¼ mashed avocado and 1 tablespoon 'Chups. Serves 4 [Per serving, without the bun: 340 calories, 17g fat, 33g protein, 8g carbs, 4g sugar]. Preheat the oven to 400 degrees. Cut the spaghetti squash in half, scrape away the center seeds and pulp, then lay the two halves face down on one half of a baking sheet. Add the broccoli to the other half. Cook the squash and broccoli for 30-45 minutes, until the squash is tender (check by piercing it with a fork). To prepare the chicken: heat a nonstick skillet to medium heat. Coat the bottom with nonstick cooking spray. Rub both sides of the chicken breasts generously with the Italian seasoning and parmesan. Add the chicken breasts to the skillet. Cook for 10 minutes on each side, until the breasts are cooked through the center. In a separate saucepan, heat the sauce on medium-low heat until hot. Scrape the spaghetti squash with a fork and transfer the strands to the saucepan to mix with the sauce. 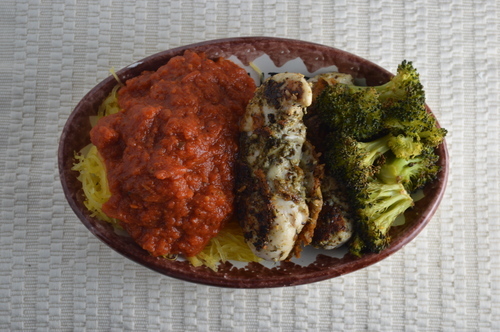 Serve 4 plates with the spaghetti squash, chicken and broccoli. Serves 4 [Per serving: 350 calories, 14g fat, 20g carbs, 9g sugar, 36g protein]. Preheat the oven to 450 degrees. Cut the spaghetti squash in half lengthwise and scrape out the seeds. Place the squash halves on a baking pan face down. Bake for 35-40 minutes, until the squash is tender and can be pierced with a fork. Remove from the oven and allow the squash to cool, then scrape the flesh with a fork - it should fall free from its skin and resemble angel hair pasta. Heat a large skillet to medium-high heat. Add the ground turkey and use a spatula to break apart into pieces. Cook until lightly browned. While the meat cooks, blend the tomatoes, garlic, basil, mint, red pepper, salt and pepper in a blender until thick. Pour the sauce into the skillet and bring to a simmer. Turn the heat to low and cover, cooking for another 5-7 minutes. Stir in the spaghetti squash strands. Serves 4 [Per serving: 220 calories, 9g fat, 13g carbs, 23g protein, 7g sugar]. Preheat the oven to 450 degrees. Scrape out the cavity of the zucchini halves using a mellon baller or spoon. Transfer the pulp to a food processor and mix with the prepared pesto, lemon juice, kale and walnuts. Set aside the zucchini-kale pesto. Bake the zucchini halves face down on a lightly greased baking sheet for 8-10 minutes until tender. Remove from the oven. Fill each cavity with the pesto. Top with the cherry tomatoes and mozzarella cheese. Set the oven to a broil. Place the pan back in the oven and broil for 6-8 minutes until the cheese is melted and slightly bubbling. Makes 2 servings [Per serving: 295 calories, 19g fat, 20g carbs, 10g protein, 9g sugar]. Place eggplant cubes in a strainer and sprinkle kosher salt to draw out the water. Set aside. Meanwhile, heat a large skillet to medium heat. Add onion, garlic, capers, green olives, and red wine vinegar. Cover and sauté 10 minutes stirring occasionally, until onions are translucent or even slightly browned. Using a paper towel, squeeze the remaining water out of the eggplant like a sponge. Transfer the cubes into the skillet and turn the heat up to medium-high. Cover but stir occasionally, cooking the eggplant until it turns brown and crispy, around 10-12 minutes. Turn the heat to a low simmer and add the marinara sauce. Cook for another 5 minutes until hot, then remove from the skillet and serve. Preheat the oven to 450 degrees. Place cauliflower florets into a food processor and pulse until a rice consistency forms. Fill a large pot with an inch of water and add cauliflower. Bring to a boil and cook 5 minutes. Strain, and then transfer to a thin dish towel. Wrap the rice in the dish towel then twist and squeeze to wring out the excess water. Transfer to a large mixing bowl and beat in egg, goat cheese, salt and pepper to form the crust dough. Place dough onto a baking sheet lined with parchment paper, pressing lightly to make a thin crust. Bake for 12-15 minutes, or until the crust is golden brown. Add your toppings and bake for an additional 8-10 minutes. Preheat the oven to 375 degrees. Cut both eggplants in half lengthwise, then scoop out a portion of the center (saving the pulp). Place face down on a baking sheet lined with nonstick cooking spray. Bake for 15-20 minutes until tender and lightly caramelized. While the eggplant is baking, heat a sauté pan with the olive oil. Add the leftover eggplant, spinach, mint, tomato and onion. Cook for 5-10 minutes, stirring frequently. Transfer the sautéed vegetables to a blender and pulse with the greek yogurt, salt and pepper until creamy. Remove the eggplant from the oven and fill each hollow with approximately 1/4 cup of the yogurt mixture. (Optional - place back in the oven to bake for 5 more minutes). Serves 2-3. Prepare the yogurt dill sauce by mixing the juice from 2 lemons, 1 tablespoon minced garlic, ¼ cup chopped fresh dill and Greek yogurt. Set aside in the refrigerator. Preheat the oven to 400 degrees. Line a baking sheet with foil and place the salmon skin-side down. Whisk the lemon juice from the remaining two lemons, 1 tablespoon garlic, ¼ cup chopped fresh dill, sea salt and pepper. Pour over the salmon fillets. Bake for 15 minutes, until the salmon flakes with a fork. While the salmon cooks, purée the cauliflower florets in a food processor until a rice consistency forms. Heat a skillet to medium-high heat and heat the olive oil. Add the cauliflower rice and cook for 10-12 minutes, stirring frequently. Serve the salmon over the cauliflower rice and top with the yogurt dill sauce. Makes 4 plates [Per serving: 300 calories, 13g fat, 10g carbs, 3g fiber, 4g sugar, 37g protein]. Preheat the oven to 400 degrees. Spray a baking sheet with the nonstick coconut oil. Place the the spinach leaves on one side of the pan and the mushrooms on the other. Cook for 25-30 minutes. With 15 minutes left, heat a skillet to medium-high heat and coat the bottom with the coconut oil spray. Add the chicken breast cubes and cook for about 12 minutes, flipping occasionally until the chicken is fully cooked. Prepare the pesto by pulsing the avocado, cashews, basil, salt and pepper in a food processor. Serve the chicken with the spinach, mushrooms and avocado pesto. Makes 1 plate. Preheat the oven to 400 degrees. Spray the bottom of a large baking dish with coconut oil. Add the Brussels sprouts to one side of the pan, then spray the top with coconut oil and sprinkle salt and pepper. On the other side of the pan, arrange the carrots. Drizzle the honey and sprinkle the cumin evenly over the carrots. Bake for 35-40 minutes until golden brown. With about 15 minutes remaining, spray the bottom of an oven-proof skillet (cast iron, for example) to coat and add the lamb chops. Spray the top lightly then sprinkle with the spice mix. Heat the pan to medium-high heat on the stovetop and sear for 3 minutes on each side. Place the pan in the oven and cook for 8-10 minutes, until the lamb reaches your desired doneness. Serve the lamb loin chops with the Brussels sprouts and carrots. Serves 2. Set oven to a broil and place the oven rack in the middle of the oven, about 6 inches from the broiler. Place your choice of protein, zucchini and bell peppers on 1-2 broiler pans lined with foil. Broil for 8-15 minutes (depending on the type of meat) flipping halfway through. The vegetables should take 8-10 minutes, though continue to cook the meat until it reaches your desired doneness. Prepare the salad by mixing the romaine lettuce with the roasted vegetables, protein, crunchy chickpeas and feta cheese. Toss with tahini and serve warm. Serves 4. Preheat the oven to 450 degrees. Toss the cubed sweet potatoes with nonstick cooking oil and the cumin and turmeric to coat. Lay flat on a baking sheet and roast for 30 minutes, stirring occasionally. Remove from the oven and transfer to a large mixing bowl. Toss with the avocado, lettuce, feta and chickpeas. Makes 2 bowls [Per serving: 330 calories, 37g carbs, 16g fat, 12g protein, 5g sugar]. Heat a skillet to medium-high heat. Lightly grease the bottom with nonstick cooking spray and add the green onions, shiitake mushrooms, salt and pepper. Sauté for 4-6 minutes until lightly brown and tender. Transfer to a large mixing bowl. Toss to combine with the greens, protein, cheese, tomatoes and avocado. Optional: add dressing of choice or freshly squeezed lemon juice. Makes 1 salad [Nutrition will vary depending on ingredients]. Preheat the oven to 425 degrees. Lay the mushrooms, sweet potatoes, beets and asparagus flat on a baking sheet. Drizzle with the avocado oil, then sprinkle salt and pepper. Roast the veggies until tender - 20-25 minutes for the asparagus and mushrooms and 40-45 for the beets and potatoes. Combine all of the ingredients in a bowl with the fresh lemon and green onions. Serves 1 [Per serving: 240 calories, 7g fat, 40g carbs, 6g protein, 16g sugar]. Set the oven to a broil. Place the turkey burgers on a foil-lined baking sheet and cook 5 minutes on each side. Simultaneously cook the quinoa according to the instructions on the package. While the burgers and quinoa cook, toss the kale with the Tahini Detox Dressing and massage to coat. To prepare the nourish bowls, fill two bowls with portioned quinoa. Top with the dressed kale, tomatoes and flax seed. Top each bowl with a turkey burger patty. Serves 2. Cut the chicken breasts into cubes then place in a large Ziploc bag. Pour the salsa into the bag and refrigerate, allowing the chicken to marinate for at least one hour. While the chicken is marinating, chop the tomatoes, red onion, cilantro and remove the corn from the ear. Set aside. Heat a saucepan to medium heat and coat the bottom with nonstick cooking spray. Add the chicken cubes. Cook for 8-12 minutes, stirring occasionally so it evenly browns. While the chicken cooks, heat the beans in a small saucepan. When the chicken is cooked completely, remove and serve in a bowl with the beans, tomato, red onion, corn and cilantro (optional - serve over romaine lettuce). Top with Jalapeno Ranch Dressing. Makes 4 bowls. To make the avocado pesto, pulse the avocados, basil, garlic, lemon and kosher salt in a food processor until creamy. Cook the zucchini noodles in a saucepan on medium-high heat until hot, then toss with the pesto sauce. Fill a pot with an inch of water and bring to boil. Put the sweet potato noodles in a steamer basket and place over the pot of boiling water. Boil 3-4 minutes until tender. While the sweet potatoes boil, prepare the sauce by combining the peanut butter, soy sauce and agave until smooth. Transfer the sweet potato noodles to a large mixing bowl. Pour in the sauce and toss to combine until evenly coated. When the mixture cools, add in the cilantro and green onions. Makes 4 servings [Per serving: 150 calories, 4g fat, 24g carbs, 3g fiber, 11g sugar, 4g protein]. Heat a skillet to medium heat. Add the zucchini, red onion and asparagus and sauté for 5-6 minutes until hot. Toss veggies with the fresh lemon juice, apple cider vinegar, tarragon, salt and pepper. Top with the tomato slices. Makes 2 servings [Per serving: 111 calories, 19g carbs, 0g fat, 8g protein, 11g sugar]. Heat a skillet to medium-high heat. Add the olive oil and garlic. Sauté 2-3 minutes, then add the noodles. Turn the heat to medium and cover the skillet. Cook the vegetable noodles for 4-5 minutes until tender. Transfer to a large mixing bowl and toss with the parsley and parmesan cheese. Serve into 2 bowls [Per serving: 90 calories, 7g fat, 7g carbs, 5g protein, 5g sugar]. Prepare the noodles according to the instructions on the package. While the noodles cook, make the sauce by combining the hummus, soy sauce, honey and sesame oil until smooth. Drain the noodles using a strainer. Transfer to a large mixing bowl. Using tongs, toss the noodles in the sweet sesame sauce. Makes 8 servings [Per serving: 260 calories, 9g fat, 42g carbs, 6g sugar, 9g protein]. Prepare the noodles. Transfer to a large mixing bowl. Set oven to a broil. Lay the chopped artichokes, olives and tomatoes on a baking sheet lightly greased with nonstick cooking spray. Broil for 5 minutes. Toss with the noodles, tzatziki and feta cheese. Serve warm. Serves 4 [Per serving (using Explore Asian bean pasta): 335 calories, 9g fat, 25g carbs, 31g protein, 9g sugar]. Preheat the oven to 450 degrees. Cut the spaghetti squash in half lengthwise and scrape out the seeds. Place the squash halves on a baking pan face down. Bake for 35-40 minutes, until the squash is tender and can be pierced with a fork. Remove from the oven and allow the squash to cool, then scrape the flesh with a fork - it should fall free from its skin and resemble angel hair pasta. Heat a large skillet to medium-high heat. Once hot, add the olive oil to coat the bottom. Sauté the prosciutto, peas and onion for 5-7 minutes, stirring occasionally. Add in the squash strands and parmesan cheese and stir to combine. Cook for another 3-4 minutes then serve. Serves 4. Prepare the black bean noodles according to the instructions on the package. Heat a large skillet to medium-high heat. Add the broccoli, olive oil, garlic and red pepper and sauté 6-8 minutes. Turn the heat to low and cover. Strain the noodles and add them to the skillet, tossing to combine. Remove from the heat and mix in the tomatoes before serving. Serves 4. Place cauliflower in a microwave-safe bowl with one tablespoon of water. Cover with a microwave-safe lid or plate and microwave for 1 minute. Stir, and continue to microwave for 30-second intervals until cauliflower is tender (on the softer side is better). Add the steamed cauliflower to a blender with the vegetable broth, garlic powder, olive oil, milk, and parmesan cheese. Blend until creamy. Pour the alfredo sauce into a saucepan and heat to medium-high heat, then turn down the temperature to allow the sauce to simmer. While the sauce simmers, prepare the noodles (see our Zucchini Noodles recipe or follow the directions on the package). Remove the sauce from the heat and pour over the noodles. Add avocado, arugula, basil, olive oil, parmesan, salt and pepper in a food processor. Pulse to combine until creamy. Set aside. Heat a saucepan to medium heat and add zucchini. Cook 10 minutes then stir in avocado sauce and cook for another 5 minutes until hot. Remove from the heat and toss with tomatoes. Sprinkle with extra parmesan and serve warm. Serves 4. Fill a pot with water and noodles and bring to a boil. Cook based on the directions on the package then strain and return to the pot. If you are using spaghetti squash, bake for 50-60 minutes at 400 degrees then scrape squash with a fork and set aside. Meanwhile, combine milk, cheeses, cornstarch, salt and pepper in a small saucepan. Cook on medium-high heat until mixture starts to bubble, stirring frequently to prevent the bottom from burning. Turn to low heat and simmer until cheese is melted. Pour cheese sauce over macaroni or squash and stir to coat. Serves 4-6.